A Learn-to-Crochet WIP: How Hard Can It Be? When one is motivated by fresh DIY home decor, it seems anything is possible. Making a promise to learn to crochet is one of those possibilities. It’s all going down at the Interweave offices, as two non-crocheting employees attempt to make the Lofty Pouf, from Crochetscene 2017. Now, let me tell you what Sara knows and what you don’t: I don’t practice the yarncraft. I don’t crochet, nor do I knit. I have delved into beginner embroidery. I have also created incense burners by repurposing wine bottles (all you need is a diamond core drill bit and a hankering for wine). But knitting needles and crochet hooks have never been part of my repertoire. The appeal of this project is that it requires no tools at all: it’s hand crochet. 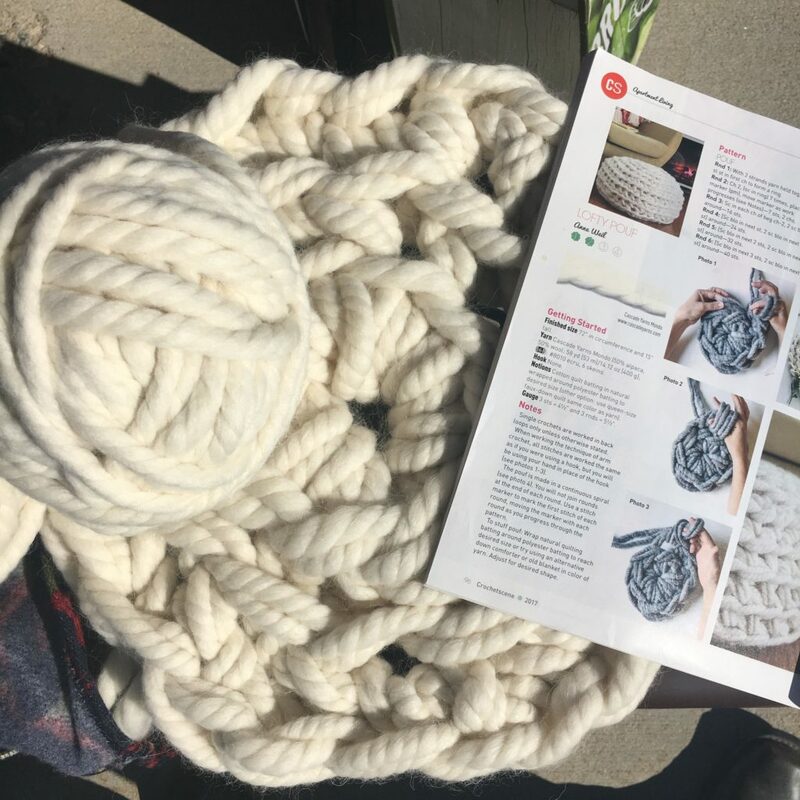 Once I asked enough yarnies at Interweave and got the validation I needed – “hand crochet is the kind of thing taught to children at summer camp” – the yarn order was placed. This is Mondo, by Cascade, a 50/50 blend of Superfine Alpaca and Wool. 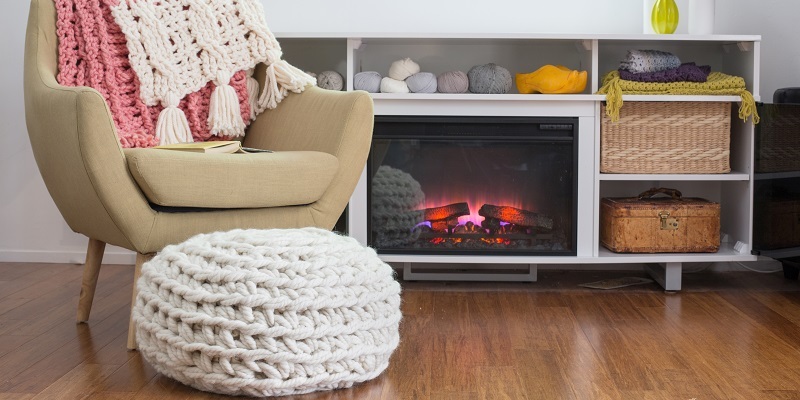 Much of the appeal of the pouf is the fact that it requires really huge, soft yarn. 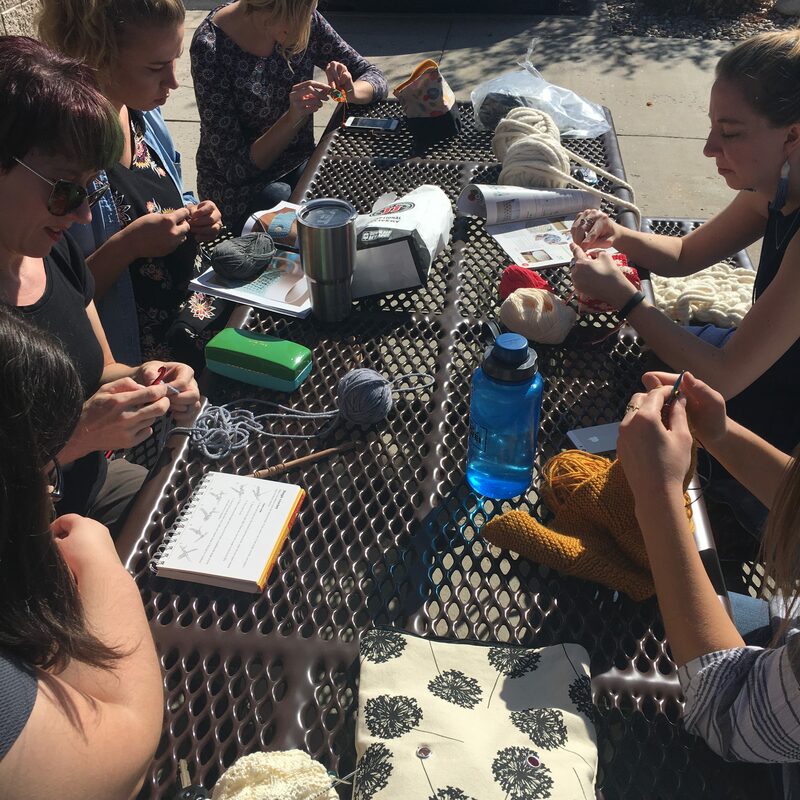 When you’re doing it right – your yarn-wrapped fingers methodically looping and pulling – you’re suddenly wrist-deep in hygge. I’ll be making the Lofty Pouf in Cascade Mondo “Ecru”, as shown in Crochetscene 2017. On the other hand, this project requires that I work from not one, but two giant yarn balls. The yarn will get twisted as it is fed from the balls. You have to stay on top of your tension, lest you get a loose pouf. In my low moments of beginnerhood, those two yarn balls are harshly judging me while my novice brain is trying to keep track of what it is doing. All anthropomorphism aside, I would have been laughed out of summer camp, I fear. Without Crochet Whisperer Sara Dudek at my side, none of this would have happened. I find myself circling back to Sara, at her house, in her dining room. I work the stitches while she instructs me on where to pull through next, and how many times. We do it again at the Interweave office. Sitting with me, she says, “okay now do this”, and I do it and then ask her what to do next. 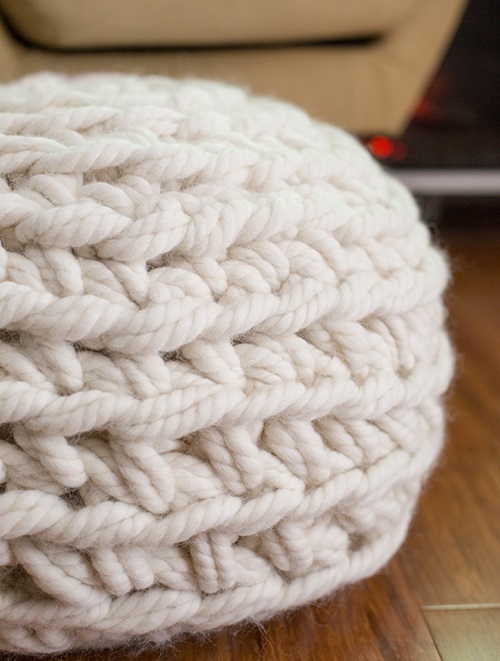 By the end of this hand crocheted pouf, will I know what to do next without Sara? It doesn’t feel like it right now, but I am going to keep going, even if I have two slowly shrinking heads of jumbo yarn staring at me with complete disdain. My friends often think that because I work at Interweave there is no fiber art I haven’t mastered. Unfortunately my friends are dead wrong. So when our Web Guru Jenn asked me to learn to crochet I jumped at the chance. “This will be so fun,” I thought. “I’ve always wanted to crochet!” I burbled. “I’ve been knitting for years, so how hard can it be?” I asked. 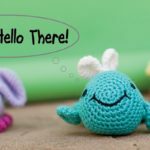 I am no stranger to crochet techniques: I’ve worked on crochet books and videos and can distinguish between single and double crochet at 10 paces. I’d just never really done it myself. But I had a hook and I had some yarn. Most importantly, I had an adorable pouf to create. And that is precisely where things started going south, because Jenn didn’t want me to crochet, she wanted me to arm-crochet, where everything from the elbow down becomes your hook (I’ve never tried arm-knitting either, but it is totally a thing). 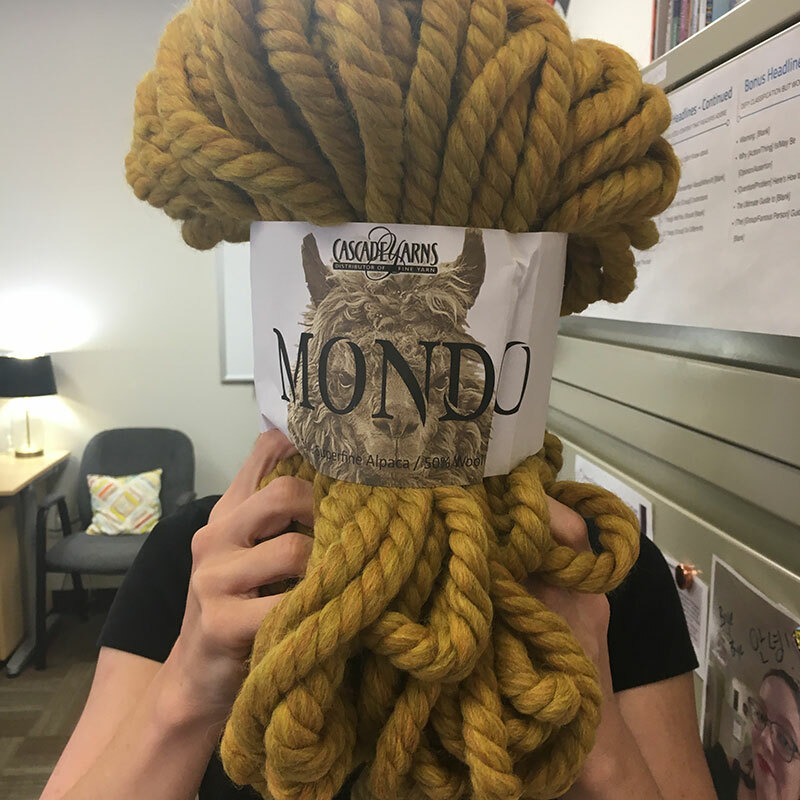 Moreover the yarn wasn’t any yarn, but Cascade’s Mondo. A mere 58 yards weighs nearly a pound, and I would be using this doubled. Still, I felt I could create something pretty, and in pretty short order. What I created was a mess. Trying to create giant stitches using my bare hands with a doubled rope of fuzzy yarn bigger than my head was beyond me. Let’s back up a bit, I thought. How’s about learning, like, normal crochet first? See? It really IS bigger than my head (the color is Birch Heather, in case you are wondering!). Armed with a copy of The Crocheter’s Companion and the company of all of Crochet Corner, I set out again. They were encouraging; I was not having it. Allison tries to start with a hook. And tries, and tries again. [Inner Voice] You’re starting to flail. You need to stop flailing. You’ve threaded looms and once fixed a toilet using a blender part. You got this. Eventually I did get it, thanks to their patience, and produced a wonky-but-perfectly-acceptable strip of single crochet. It is possibly one of the most exhausting things I’ve done in weeks. Pick Up a Hook and Crochet a Stuffed Animal!